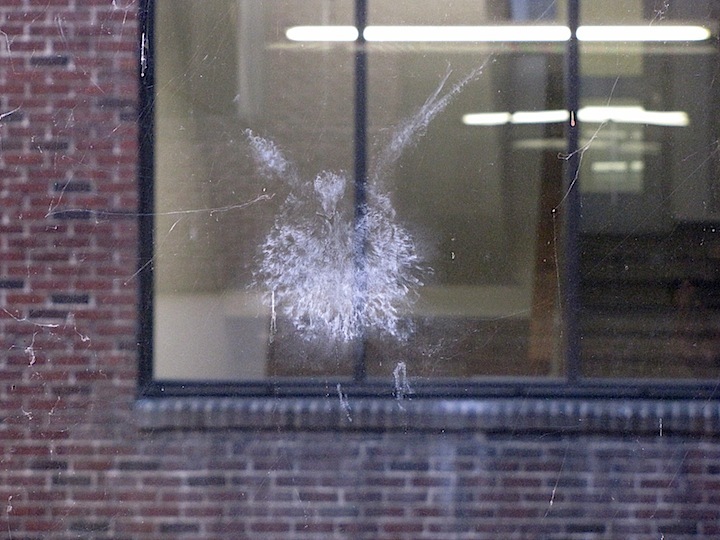 What was the pigeon's last conscious thought at the instant captured here so hauntingly on glass? There was nothing tentative about this swoop down the open atrium, no hint of trouble—wing beat is frozen just as down-stroke began; head forward, dead on. Even the feet felt the impact…or did they, striking as they did a split second after the head? Did the bird mistake the dark, inner space of the stairwell as refuge— perhaps from grasping talons? Might death have been swifter, kinder this way than by a hundred tearing bites of falcon beak? THIS just blew me away. It is compelling, intriguing, and soulfully moving. I have never seen anything like it, EVER. But that is one thing I've learned about nature; if we are aware we ALWAYS see things we have never seen before, something astounding, mind blowing, and of course things that leave us awestruck and deeply moved. Changed. I may have missed something here, but did you take both these photos? What an opportunity to see this and photograph it. You must have been totally captivated by the whole thing. The ghostly spectral left on the window is unlike anything I've ever seen. One of those once in a lifetime photos. Both photos, the story you wrote, and the questions you raise brought tears to my eyes. 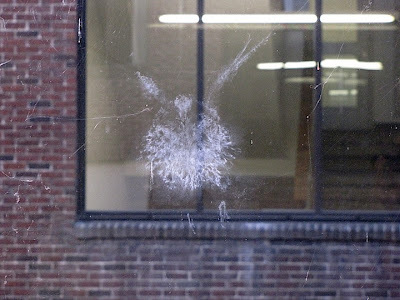 Part of what moved me was the exquisite beauty both in the ghostly image of the bird in flight (on the window), AND even its limp, soft-looking, smooth gray body. Especially laying against the more sharp and angular rock. Thank you for taking the time to share this Jeffrey. So so sensitive, beautiful, and makes us all aware of how much we don't see in the world, how much is going on all around us, how many other species are trying to stay alive in an often human dominated world. 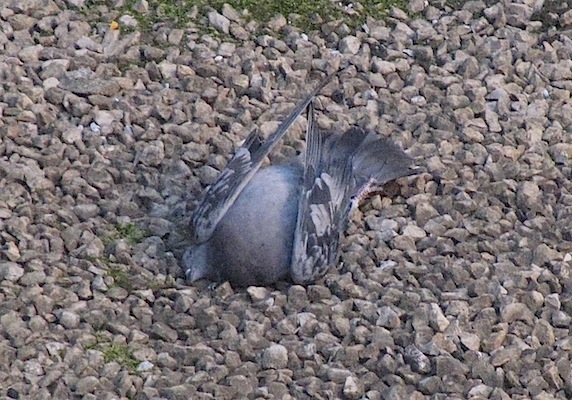 It made me wonder if pigeons mate for life, did it get to finish raising it's young, can they survive without it (although they are at the end of the season and probably fairly large, can they survive)? So many questions. We are not alone on this planet. We are not the only ones with families, mates, desires, needs, ability to share love, and more. Beautiful sensitive sharing my good friend. Dear Jeffrey your soul shines so soooo beautifully. Yo are filled with the sensitive wild that you love so much, are so aware of. You are a wonderful reflection for me, always encouraging me to be ME. Thank you from my heart for that. Thank you. Thank you, thank you, Robin. I know what you mean about the contrast of the harsh haunting snapshot impression of death with the softness and repose of the body. Yes, I took the photos. It happened in my office building - an old school building. Sorry I can't look at your video clip right now, but hope to next week sometime. Thanks again for all your kind words and thoughts! I hope you are well and happy!